Badusha or Balushahi Recipe is deep fried Indian festive sweet made with flour and later dipped in sugar syrup. These sweet treats are crispy on the outside, moist, tender, and flaky on the inside. My list of Diwali sweets is endless. 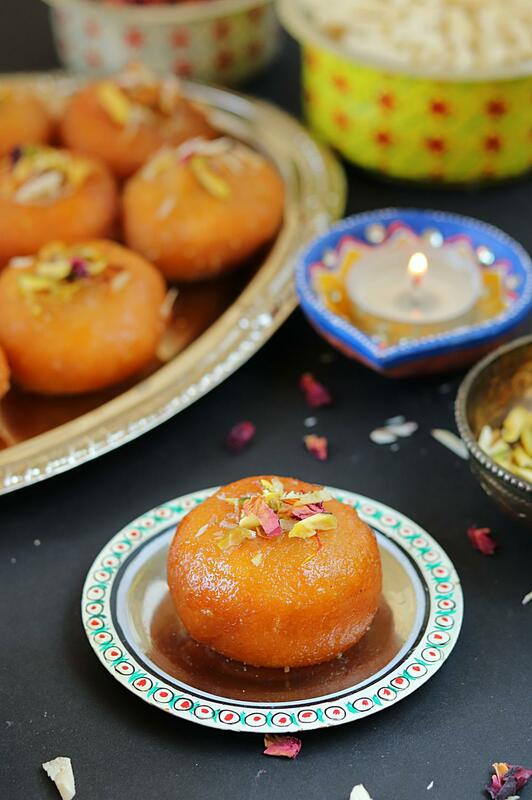 I have tons of recipes on my list that I need to get my hands on, but I end this year with this delicious sweet treat – Balushahi recipe or Badusha. Balushahi is a Mughlai dish and was a popular dish in the kitchens of Moghul emperors. Wondering what does Bhalushahi means? Balu or Balo refers to sand or something that has a texture that resembles sand. Since balushahi has a flaky texture that just crumbles and melt-in-your-mouth, it’s therefore referred to as balu. Its outer layer shines like a sand, hence it’s referred to as balu. ‘Shahi’ means royal. Balushahi is not a doughnut! Balushahi recipe or Badusha is a sugar glazed deep-fried flaky dessert. Some refer to as a doughnut but actually ,it’s not a doughnut. A doughnut is soft and spongy whereas Balushahi is flaky and crumbly. The making of doughnut involves yeast whereas Balushahi is prepared with flour, baking powder and curd combination. Doughnuts have an even surface and formation whereas in Balushahi uneven surface and edges means a much flaky and crispier balushahi. Doughnuts have pa rominent visible hole in the center whereas some balushahi do have a small hole in the center but most of them disappear during frying. Balushahi puffs during frying and that makes the hole disappear. If you get the basics of Balushahi making, then this recipe is a simple process, though time consuming. Start by kneading a soft pliable dough. Cover the dough with a wet cloth and let it rest for 20 minutes. Meanwhile ,prepare the chasni or sugar syrup. This recipe requires a 1-string sugar syrup. Step by step tutorial shown below. Flavor the sugar syrup with cardamom, rose water and saffron strands. 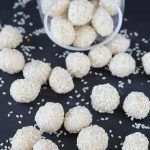 Shape balushahi like round balls and make a small indent in the center. Choice of fat (ghee or oil) makes a significant difference in this recipe. Frying in ghee adds a nutty taste and flavor to these balushahis. Do not over heat the ghee. Balushahi needs to be fried in a moderate hot ghee. Do not overcrowd the kadai. As the balushahi starts to float on top, fry them on a medium – low heat until golden brown in color, turning occasionally. Do not rush through this process. If cooked in hot ghee, they will be cooked from outside but will remain raw on the inside. Remove from oil and drain on a paper towel. Drop balushahi in the hot sugar syrup and allow them to soak for good 20 minutes. Garnish with dry chopped nuts, rose petals and saffron strands. Enjoy!! This festive season do give these yummy balushai a try and if you happen to make these treats then share your pics with me @facebook or tag me by using the hashtag #ruchiskitchen (one word) on social media. Would love to hear back from you! Wish you all a happy n Prosperous Diwali!! In a large bowl sift together flour, salt, baking soda and baking powder. Add ghee, and chilled curd. Mix the dough until it resembles a bread crumbs. Pour in 1-2 tablespoon cold water and knead until it forms a soft dough. We need a soft dough so add water accordingly. You may not need a whole lot. For me it was - 1.5 tablespoon of water. Cover the dough with a wet cloth and let it rest for 20 minutes. Meanwhile, let's prepare the chasni ( sugar syrup). In a heavy-bottomed pan, add sugar and water (as mentioned in the recipe). Add lemon juice. Lemon juice will prevent sugar from crystallizing. Bring it to a boil. Boil for 3-4 minutes on medium high. Keep a close watch on the syrup for its consistency. Remove and discard the impurities as they start to collect on top. At this point add eliachi powder, saffron strands and rose water. Lower the heat, dip spoon in the syrup and take it out. Do not touch for the first few seconds, it will be very hot. Touch the syrup with your finger and if it coats your finger it means that it is about to reach it's first string consistency. To test - press your forefinger and thumb together. Start pulling them apart. If the thread or sugar string between your finger and thumb doesn't break after pulling apart, single thread or 1 string sugar syrup is ready. Take it off the flame and continue with the recipe. Time to make Balushahi. Divide the dough into equal parts. To make balushahi - shape dough like a round ball. With your thumb make an indent in the center. Repeat with rest of the dough. Heat oil in a kadai. Do not over heat the ghee. Balushahi needs to be fried in a moderate hot ghee. Drop balushahi gently in ghee, do not overcrowd the kadai. Soon balushahi will start to float on top. Fry on a medium - low heat until golden brown in color, turning occasionally. Do not rush through this process. If cooked in hot ghee, they will be cooked from outside but will remain raw on the inside. It took me 20-25 minutes to fry a single batch of balushahi. Remove from heat and allow it to drain on a paper towel. Drop balushahi in the warm sugar syrup. Gently press them down in the syrup until they are fully submerged in the syrup. I had allowed them to soak for good 20 minutes. Remove from syrup and garnish with dry chopped nuts, rose petals and saffron strands. Repeat the process with rest of the batch. Crispy and flaky balushahi from the inside. Store in airtight container and good for 1 week (at room temperature).